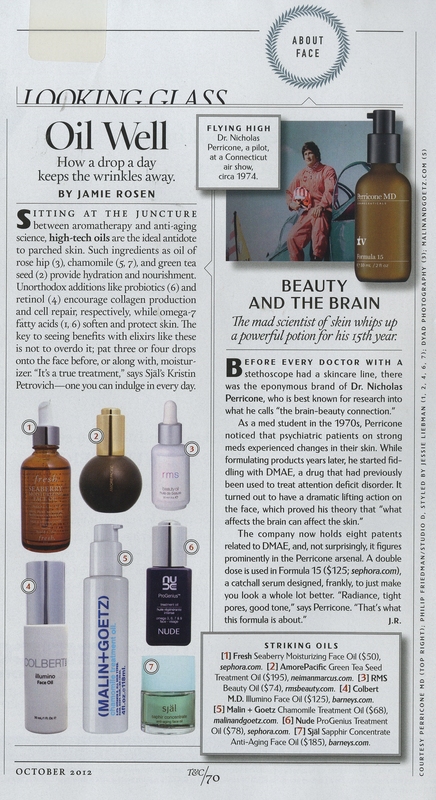 The October issue of Town & Country highlights today’s major trend in skincare: facial oils. Despite the conventional belief that oils cause breakouts, more consumers are realizing that oils are more easily absorbed and better moisturize skin better than their mainstream creamy counterparts. Is your skin in dire need of some nourishment? Then here is some food for thought: your body naturally produces oils–not heavily fragranced creams–so why not apply something that your body already recognizes and utilizes? Just a few drops applied daily will not only moisturize parched skin but also combat fine lines and provide instant radiance. The rms beauty oil is an elixir packed with rose hip, tamanu, jojoba and buriti oils (not to mention several high quality herbal extracts) is also designed to work synergistically with other rms beauty products. Use as a primer before applying the “un” cover-up, which seamlessly blends into hydrated skin to conceal blemishes. Next time you’re debating on your next skincare purchase, skip the lotion aisle and make a beeline for the oil section.